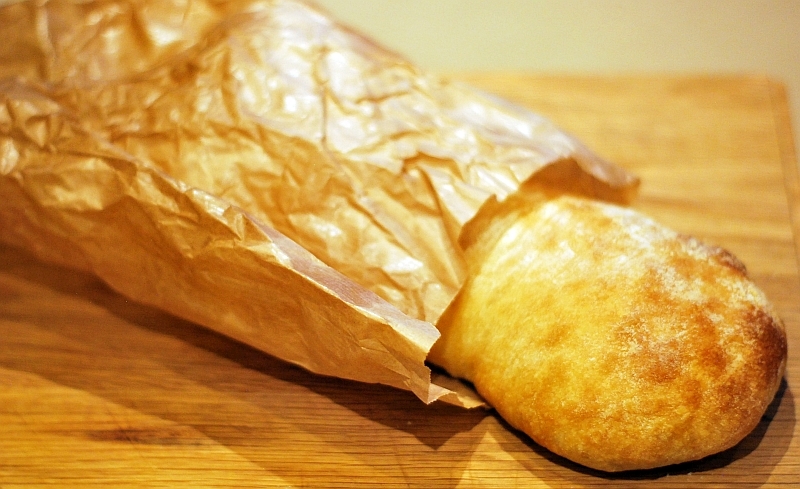 Ciabatta, the famous Italian slipper. You can mass produced variation of this bread almost everywhere so it feels like it has been with us forever. But do you know that ciabatta is only 36 years old? In terms of bread history it is infancy! For me it doesn’t matter, I love this bread. It’s soft oily crumb, open texture. It is absolutely amazing when sliced, drizzled with olive oil and lightly grilled. It makes ideal base for bruschetta as well. Nice as it is I refuse to buy mass produced breads as I find their flavour inferior. At the same time I do not want to give up on eating this wonderful Italian bread. So I have been baking ciabatta for the last 5 years. Over time I changed, tweaked and improved both my recipe and method. I started with traditional bakers yeast version but recently I started to make sourdough ciabattas. I must tell you that if you like traditional yeast based ciabatta you will love the sourdough version. It is not that difficult to bake either. So don’t wait, bake! Equipment required: baking stone (or flat baking tray turned upside down), large mixing bowl with a lid or shower cap to cover the bowl. Put the starter and water into a bowl and mix well. Add the flour and mix into a rough dough. Sprinkle over with salt, cover and leave to for about 30 minutes (this is called the autolyse stage). Pour about 35g of the oil around the edge of the dough (this will add flavour to the dough but also help it from sticking to the bowl). Start working the dough by pulling it from the edges and pressing into the middle and then turning the bowl by 90 degrees (here you can find instructions on how to knead the dough in a bowl). Do it just for about 12 repeats. Cover the bowl and leave for about 45 – 60 minutes. Now gently pull the edge of the dough and fold it over without pressing in. Turn the bowl by 90 degrees and repeat. Do 4 stretches and folds altogether. Cover and leave for 45 – 60 minutes. Repeat the stage 3 another 2 times adding the remaining oil if necessary. You should end up with a smooth, wet and fairly airy dough. Leave to rest in the fridge for 8 – 12 hours (or more if the starter was not very active). You are looking for a well fermented dough after resting, preferably showing some blisters on the surface. Pre heat the over to 250 centigrade with a baking stone (or flat baking tray) placed in the middle. Very gently tip the dough out onto a heavily floured work surface trying to retain as much trapped air as possible. Fold the dough into a rectangular shape, then flip it over and tuck in the underneath. It should be a fairly fat rectangle. 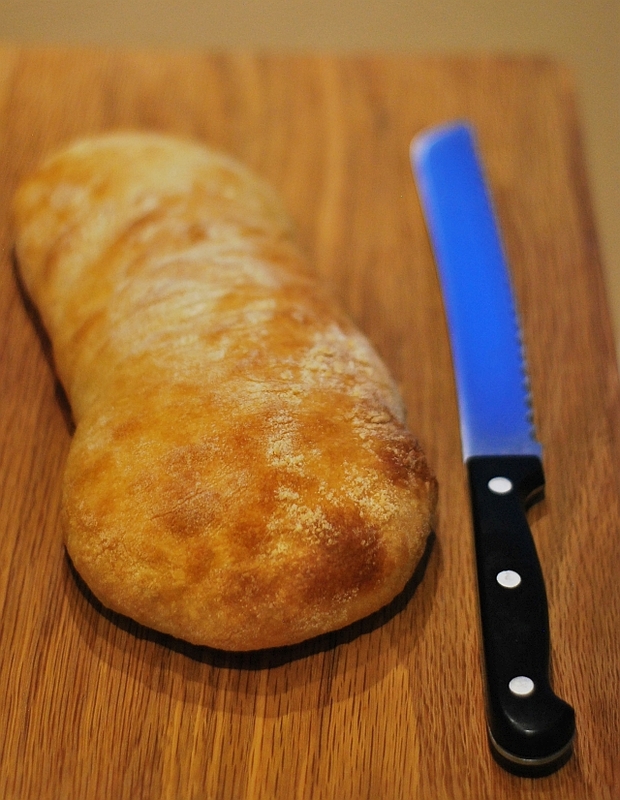 Cut the dough into 2 slipper shaped loaves using a metal scraper. Roll the loaves in flour and then leave to rest for about 10 minutes. Remove the pre heated baking stone (tray) from the oven and place it on a cooling rack. 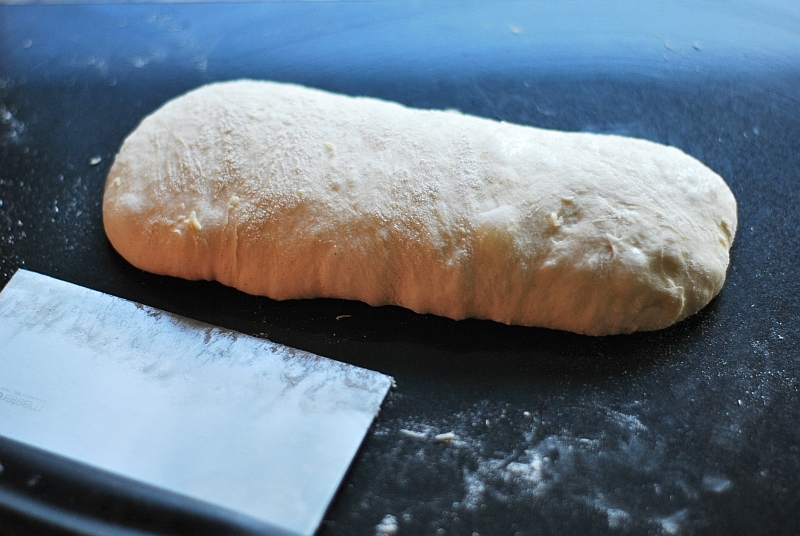 Transfer the ciabatta onto the pre heated baking stone / tray and place back in the oven. Bake for about 20 – 25 minutes. After the first 10 minutes reduce the temperature to 235 centigrade. 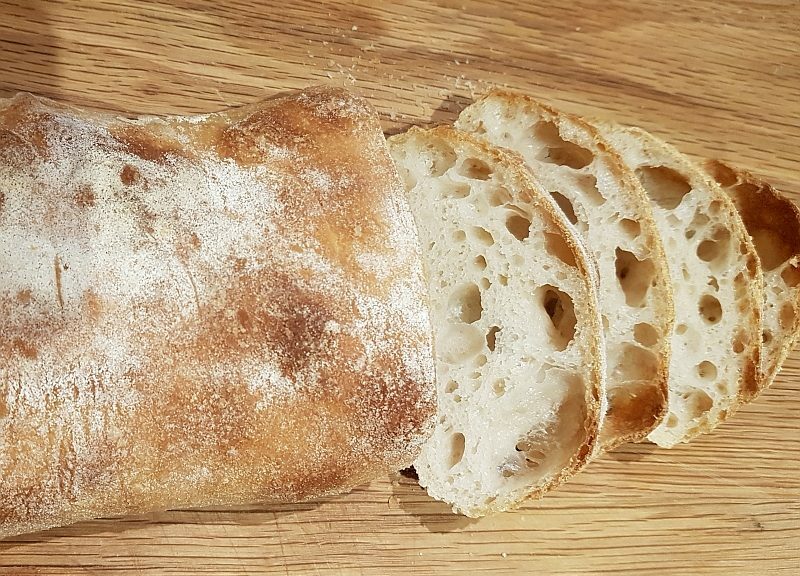 You don’t need to place a tray with hot water on the bottom of the oven as ciabatta is wet enough to generate its own steam. Check that the loaves are done by tapping them on the bottom. If you hear a hollow sound it is ready. If not return to the oven for couple of minutes. Allow ciabatta to cool on a wire rack and enjoy!